Quixx Paint Scratch Remover Review - Does It Work? Quixx Paint Scratch Remover Review – Does It Work? Home/Do It Yourself DIY/Quixx Paint Scratch Remover Review – Does It Work? Unsightly scratches on your electric car paint job are unavoidable over time. Getting car paint repairs from workshop are very expensive. Here’s a cheaper solution for you. It is the Quixx paint scratch remover kit. The Quixx paint repair system removes scratches, scraps and scuff marks quickly and reliably for all car paint finishes including your homemade electric vehicle (EV). How do you normally get scratches on your car paint job? Usually, we get scratches from automatic car washers, bushes, nasty finger nails and metal keys around the door handles. Sometimes we also get scratches when we drive our car too close to objects such as posts, flower pots, trash cans etc. If you park your car too close to another vehicle, scratches can also be caused when the driver of the other car opens the door and it slams into your car. This often results in unwanted paint marks on your car finish. Bummer! Save some money by using the Quixx paint scratch remover. The paint repair system has been certified by the German TUV industry test report showing outstanding performance. The Quixx system is also very easy to use. 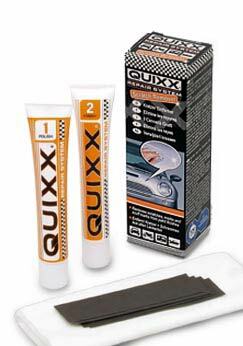 To fix a scratch on your car, begin by applying the Quixx polish number 1 to the scratched area and polish it for about 1 to 2 minutes with a clean cotton cloth. Next, remove all the residues with a damp cloth or sponge. Maintaining the paint job on your DIY electric car can be that easy. You don’t have to spend a ton of money again to fix those annoying scratches. All you’ll need now is the Quixx paint scratch remover.Now, the scratches have vanished and all it remains is a dull surface. The following step is to polish the dull surface with the Quixx finish number 2 for about 1 – 2 minutes to get the gloss back. Finally, remove any residue with a cloth. The Quixx paint scratch remover system, is available from Amazon.com for only $14.95, to get yours today, click here! Once you’ve sanded the vehicle, look for the shiny spots that the sander missed. These low areas need to be pulled or filled if you’re hoping for a uniform paint job.